Nathan Eovaldi pitched eight dominant innings and closer Craig Kimbrel held on during a shaky ninth to help the Boston Red Sox beat the second-place Yankees for the third game in a row and expand their lead in the A.L. East to season-high 8 1/2 games with the victory on Saturday in Boston. One night after Rick Porcello threw an 86-pitch, one-hit complete game, Eovaldi (5-4) shut out the Yankees through eight innings on three hits in sending them to their season-high fourth straight loss. 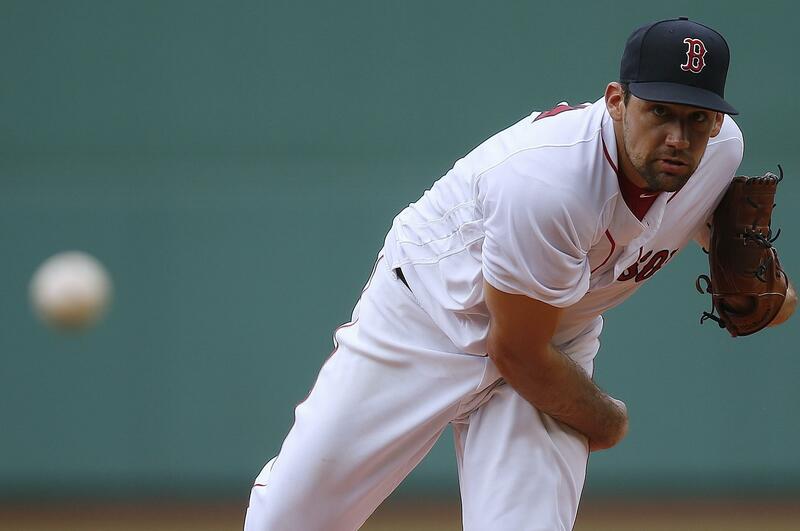 The Red Sox go for a four-game sweep on Sunday with David Price scheduled to face Masahiro Tanaka. Blue Jays 5, Mariners 1: Marco Estrada baffled Seattle’s struggling bats with his mix of offspeed pitches, taking a no-hitter into the seventh inning and leading Toronto past the Mariners in Seattle. Estrada was masterful with his changeup, keeping the Mariners guessing all night. He didn’t give up a hit until Mitch Haniger’s one-out double just inside third base in the seventh inning. It was just Seattle’s second baserunner after Nelson Cruz walked leading off the second inning. Otherwise, the Mariners’ slumping offense looked even more meager against Estrada, who entered the day with a 4.90 ERA and had allowed four earned runs in four innings in his last start. Estrada also induced plenty of weak contact as Seattle struggled to make the adjustment between speeds. Dodgers 14, Astros 0: Josh Reddick’s three-run homer highlighted Houston’s seven-run eighth, and the Astros beat the Dodgers in Los Angeles for their fourth straight win. Houston’s Lance McCullers Jr. left after 60 pitches because of right elbow discomfort. He allowed two hits over four innings in his first start at Dodger Stadium since Game 7 of last year’s World Series, won by the Astros. The Dodgers were limited to three hits in losing their fifth straight regular-season game to Houston since 2015. Indians 3, Angels 0: Corey Kluber pitched a three-hitter for his first shutout this season and new arrival Leonys Martin homered again as theIndians beat Los Angeles in Cleveland. Kluber matched zeros for five innings with Felix Pena, who carried a no-hitter into the sixth inning before Martin led off with a homer. Martin has two homers in three games since coming to Cleveland in a trade with Detroit. The Angels were again without All-Star outfielder Mike Trout, who missed his third straight game with a sore right wrist. Reds 7-2, Nationals 1-6: The Nationals scored single runs in each of the opening five innings against Matt Harvey and went on to win the second game at Washington. In the opener, Cincinnati starter Anthony DeSclafani (5-3) allowed one run in seven innings. Gio Gonzalez (6-8) lost his seventh straight decision. Phillies 8, Marlins 3: Carlos Santana had three hits, including one of Philadelphia’s four homers, and Zach Eflin allowed three runs in eight strong innings to defeat visiting Miami. Cesar Hernandez, Nick Williams and Asdrubal Cabrera also went deep for the Phillies, who won their fourth straight to move 1 1/2 games ahead of Atlanta for first place in the N.L. East. Cubs 5, Padres 4: Kyle Schwarber and Anthony Rizzo homered in a five-run second inning and the Cubs held off San Diego in Chicago. Jason Heyward added three hits and an RBI for the N.L. Central leaders. Cardinals 8, Pirates 4: Jedd Gyorko drove in three runs while Kolten Wong, just off the disabled list, and Yadier Molina both had three hits to lead St. Louis past the Pirates in Pittsburgh. Brewers 8, Rockies 4: Travis Shaw hit a grand slam during Milwaukee’s six-run first inning and the Brewers wenton to defeat Colorado in Milwaukee. The Brewers won for the fourth time in six games stayed one back of N.L. Central-leading Chicago. Twins 8, Royals 2: Max Kepler had three hits, including a two-run homer that put Minnesota ahead to stay, and Jose Berrios threw seven sharp innings to lead the Twins past the Royals in Minneapolis. White Sox 2, Rays 1: Tim Anderson scored when third baseman Matt Duffy made a throwing error on Leury Garcia’s two-strike bunt in the ninth inning, sending the White Sox to the victory over Tampa Bay in St. Petersburg, Florida. Diamondbacks 9, Giants 3: Nick Ahmed homered twice and had four RBIs, Steven Souza Jr. drove in three more runs and Arizona defeated San Francisco in Phoenix. Souza hit a two-run triple and Ketel Marte hit a two-run homer off Andrew Suarez in Arizona’s second-straight five-run first inning against the Giants. Athletics 2, Tigers 1: Khris Davis hit his 30th home run and ninth since the All-Star break, Matt Chapman also went deep and Oakland beat Detroit in Oakland, California, for its fifth straight win. Edwin Jackson pitched into the seventh inning, allowing an unearned run on five hits. Jackson struck out three and walked one to win back-to-back starts for the first time this season. Mets 3, Braves 0: Kevin Gausman was outpitched in his Braves debut by a blossoming Zack Wheeler, and the Mets stopped Atlanta’s five-game winning streak, defeating Atlanta in New York. Rookie second baseman Jeff McNeil went 4 for 4, and Austin Jackson had an RBI infield single as the Mets halted a four-game skid. Pitching against his hometown team, Wheeler matched a season high with nine strikeouts over seven innings of three-hit ball and extended his shutout streak to 17 innings. Rangers 3, Orioles 1: Former Spokane Indians Joey Gallo and Rougned Odor both homered for the third straight game, and Mike Minor worked an efficient seven innings for Texas in a win over Baltimore at Arlington, Texas. Published: Aug. 4, 2018, 10:14 p.m.